In today's world, when networks are very complex and carry many types of traffic, there is no time to wait for the phone to ring. System problems not only affect basic traffic services but also interrupt revenue producing Internet, video, and voice services. Customers are no longer willing to wait for more than microseconds before they flood the provider with complaints. Thus, network management is a critical aspect of our networks. Network management refers to the activities, methods, procedures, and tools that pertain to the operation, administration, maintenance, and provisioning of networked systems. 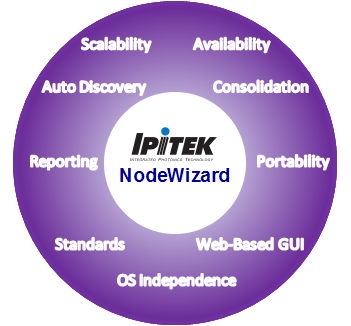 In response to these critical demands, IPITEK has pioneered in the development and the evolution of its network management system, the NodeWizard. The NodeWizard supports five major management functions: Fault, Configuration, Accounting, Performance and Security management. These five functions ensure secure and reliable operation of revenue-generating networks. The functions are explained next. Fault Management: The goal of fault management is to detect, log, notify users of, and (to the extent possible) automatically fix network problems to keep the network running effectively. Because faults can cause downtime or unacceptable network degradation, fault management is perhaps the most widely implemented of network management elements. Configuration Management: The goal of configuration management is to monitor network and system configuration information so that the effects on network operation of various versions of hardware and software elements can be tracked and managed. Security Management: The goal of security management is to control access to network resources according to local guidelines so that the network cannot be compromised. A security management subsystem, for example, can monitor users logging on to a network resource, refusing access to those who enter inappropriate access codes. Accounting Management: Accounting management is the process used to measure network utilization parameters so that individual or group users on the network can be regulated appropriately for the purposes of accounting or chargeback. Performance Management: The goal of performance management is to monitor and measure various aspects of performance so that overall performance can be maintained at an acceptable level. At the device level, performance metrics can include CPU utilization, buffer allocation (big buffer, medium buffer, misses, hit ratio) and memory allocation. The performance of certain network protocols is directly related to buffer availability in network devices. Measuring device-level performance statistics is critical in optimizing the performance of higher-level protocols. In addition, today's networks are customer centric; each customer has an SLA contract. Violating the SLA incurs certain penalties clearly stated in the SLA contract. Hence, the SLA is the main point of interaction between the customer and the provider. As a result, the provider must have all the tools to provide accurate SLA measurement. In this context, the NMS will interact with the vatious OAM elements: IEEE 802.1ag, ITU Y.1731, and IEEE 802.3ah. In order to successfully carry out its mission, the NodeWizard has the following performance capabilities and features. Reliability: 24/7 Availability: NodeWizard is designed to be available 7 days a week 24 hours a day. It is anticipated that when a database error occurs, the system might need to be taken down to run a repair on the database. Auto Discovery: This feature will allow the NMS to discover all network elements including nodes, links, and services. 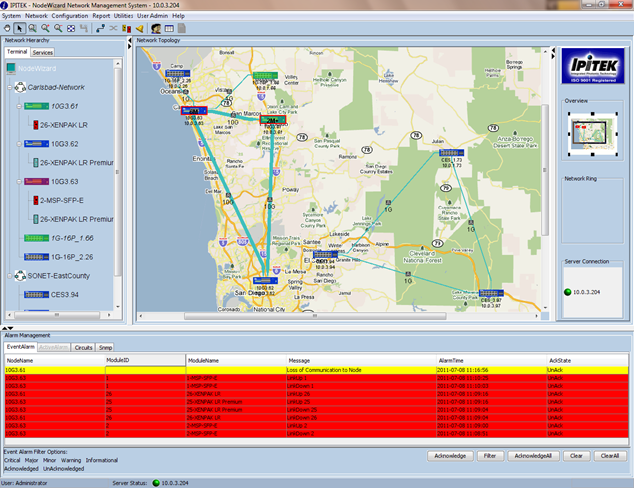 This data will be used to establish network topology diagrams and service routing diagrams. Operating System (OS) Independence: NodeWizard supports all types of operating systems including latest MS Windows, Linux, and Unix. Multi-OS support should not compromise any feature in the NodeWizard capabilities. View Consolidation and Web-Based GUI: NodeWizard has everything that a user needs to view easily accessible on a single web-based graphical interface. There is no need to switch between screens to gather information. NodeWizard web GUI stays compatible with the latest web technologies. Scalability: NodeWizard supports large installations with hundreds of separate sites and thousands of devices. Thanks to its modular design, NodeWizard scalability can always be evolved to meet the needs of any network of any size. Reporting: NodeWizard shows network health statistics and triggers. It continuously collects data and reports it to the network manager, which is essential in maintaining a healthy network. By proactively monitoring the network for performance-related issues and correlating these with other network events, you can pinpoint the source of network problems. These reports can be used to assess the impact that network issues have on business processes so that the appropriate personnel can be notified. Additionally, the ability to collect data in real-time can be used to pinpoint trends in network issues so you can take proactive measures to help alleviate network outages or decreased throughput. This can be combined with policy-based triggers, whereby an alarm is tripped if a certain user-configured threshold is exceeded. Portability/Communicability with New Devices: NodeWizard supports the communication with the latest end user access devices. For example, it can send alerts to e-mail or cellular phones in cases of an abnormal network event. Standards-Based NMS: NodeWizard is built using the "latest" standards-based functions including Simple Network Management Protocol (SNMP), Management Information Base (MIB), Remote Monitoring (RMON), etc. 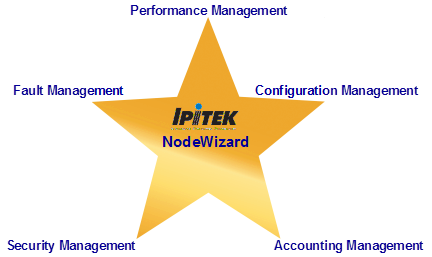 IPITEK's network management system, the NodeWizard, is an ideal solution for a user-friendly easy-to-use management tool for complex networks. The NodeWizard's core functions coupled with its advanced features make it a perfect fit as a simple, secure, scalable, and reliable tool for any type or any size network.